My grandma, the Queen of Needle Arts taught me to knit and purl about a month ago but so far, I haven't picked up the needles and started a project. This morning, I was drooling all over my keyboard as I poured over some of the stunning knit projects in the book "A Stitch In Time: Vintage Knitting and Crochet Patterns 1920-1949 vol 1" and I thought to myself "why can't I make those?" Buying reproduction or authentic knit wear can be outrageously expensive! I love knits because they are versatile, practical and add a really genuine vintage touch to your wardrobe. My little Olivia is 7 months old now so I'm often covered in baby spit-up, drool and various pureed vegetables and fruits. Needless to say, practicality is a -must- for my clothes and I simply can't wear dry clean only vintage, beaded cardigans for a while! So, I'm doing it, my dear readers! I'm going to knit something other than a Swiffer Wet Jet pad! I called Grandma this afternoon and whined about how much I want to knit beautiful vintage sweaters and things. She told me to find a beginner's level pattern and make something for Olivia. Her advice was to make something in "miniature" so that I wouldn't get bored with a normal sized sweater. She said find something easy that will be completed quickly and that will give me some practice with increasing and decreasing around the armholes. So, here it is! My first knitting project. I figure it will be great for fall and winter months! I'll let you know how it turns out!! I love the stitch in time book, I'm on the second project from it now and I'm not an amazing knitter. good luck with your first project. Wow! Good luck! I love those sweaters! I want! The last one before the baby, the teal sweater, is divine! I wish I could knit. My mother tried to teach me to crochet but the result was just a tangled mess! I am drooling over that book and am trying to wangle it for my anniversary this year. You should consider heading over to www.ravelry.com , it's a knitting website with loads of support, and groups (one for this pattern book, I believe too).. I love the one Fleur is wearing its beautiful! I wish I could knit properly - I made a scarf in the pattern of DNA once, but it was so hard, and I had to frog it so many times, that I fear starting a new project! Good luck!! I've been tempted to buy that book, but I'm not patient enough for knitting! I'm in LOVE with those sweaters! Good luck on your project. Yes I think it is a good idea to start small. My 1st project was a baby blanket made up of small squares which I sewed together&I backed it with a soft brushed cotton fabric. Now I just need the baby to go with it! As a new knitter myself I find because I am a bit slow, doing something like a sweater does get boring! It is lovely to be able to knit. OK -well I didn't get to comment on your last posting - too crazy busy with grading-which is my motto this week, and I know some bloggers don't check comments of past posts but I wanted to thank you for all your beauty tips. i am entering the MRS. New York Pageant next month and I am totally channeling you. I am doing it vintage- partularly the swimsuit section- where I will be sporting victory curls and a skirted suit. So any more tips you can give would be highly appreciated. Beth, Awww! Thank you and you're welcome! Good luck in the Mrs. New York Pageant!!! How cool would it be for a vintage girl to win? Well, if you need any last minute tips or advice on anything at all, just drop me an email and I'll be happy to help! Good luck!! Great photos! Good luck with your project. I'm actually not a big knitwear girl, but for these, I might just recant. The effect of the sleeves on that brown top is insanely cool. I'm more of a crocheter but have been dabbling into knitting for the same reason! Good luck, I'm sure you can do it! Yea, Andi I think you are 100% correct on that! I was pricing yarn the other day and holy smokes, it's really expensive too! Luckily, I can get my hands on some 50% off coupons for my local craft stores and use those on yarn. I'll have to keep a close eye on yarn sales too! So far,the baby cardigan is really coming along well! I was knitting last night and got to the point where I can knit while I watch tv. I think I'm getting the hang of it!! I've enjoyed browsing your blog! Great finds. 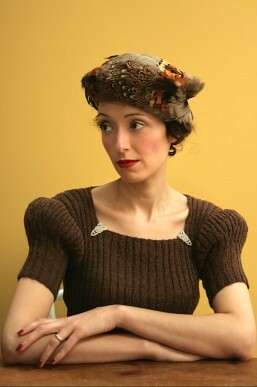 If you are still into knitting, try freevintageknitting.com for great free vintage patterns. They have a ton. Glad to have found you.